Rebecca Adlington believes she has learned from the mistakes she made in Rome in 2009 as she prepares to compete across three distances at the World Championships in Shanghai. The 22-year-old took third and fourth respectively in the 400m and 800m freestyle events in Italy after winning both at the Beijing Olympics in 2008. "It's completely different going into this Worlds than Rome," she said. "I've done so much more distance work and got a good balance in my life." 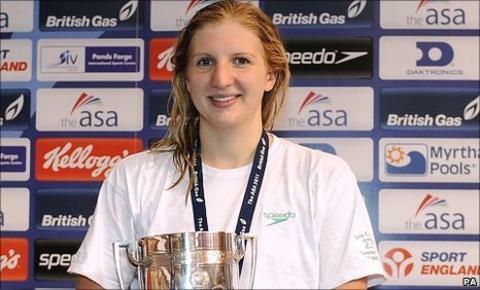 Adlington will be joined by Jazmin Carlin in the 400m freestyle on Sunday, before switching to the 200m from 26 July. I have got an agent and everything is organised and set out and scheduled. Her individual events conclude with the 800m on 30 July. Two years ago she found herself upstaged as home favourite Federica Pellegrini became the first woman to dip under four minutes for the 400m and team-mate Joanne Jackson edged her out in the battle for silver. Although Adlington took a new personal best as consolation from that race, she admits that her failure to make the podium over 800m really hurt. "I didn't even get a medal and it was the year after the Olympics and after improving in the 400m I just expected the 800m would be good as well," she added. "Looking back I hadn't done the distance work so how on earth did I expect to do a good one? "At the time it was too much and I was so upset. "I did learn from that and things are really different going into Shanghai. "I have got an agent and everything is organised and set out and scheduled. I am also older and not so naive." Adlington will renew hostilities with Pellegrini once again while Denmark's Lotte Friis and France's Camille Muffat, along with team-mate Carlin, are also strong medal contenders. Keri-Anne Payne insists she will be going all-out to regain her 10km title on Tuesday despite also competing a week later in the pool in the 1500m freestyle. Payne followed up her Olympic silver in the 10km in Beijing by clinching the world crown in Rome, but was only eighth in the 2010 World Open Water Championships, the last time it was held as a stand-alone competition. "My main focus is open water and I am going to do everything I can to make sure that race is the best," she said. "I'm not going to hold anything back just because I know I'll be swimming later on. "Then it will be a case of recovering as well as I can for the next five days for the heats of the 1500m." The pool competition begins on 24 July, with synchronised and open water events - along with diving and water polo - taking centre stage before then. Tom Daley, will hope to make amends with a successful defence of his 10m platform world title. His chances were increased following the withdrawal of Australian Olympic champion Matthew Mitcham through injury earlier this month. Also amongst Britain's 40-strong squad is Commonwealth champion Fran Halsall, who will lead the women, while double Commonwealth gold medallist James Goddard and world champion Liam Tancock head the men's contingent. The team also features a group of athletes - the likes of Siobhan-Marie O'Connor, Molly Renshaw, Joshua Walsh and Jak Scott - who have qualified for their first senior national team. The squad finalised their preparations at a holding camp in Osaka, Japan, before arriving in Shanghai. Men: Adam Brown (Hatfield/Auburn), Simon Burnett (Windsor), David Carry (ITC Stockport), Ross Davenport (ITC Loughborough), James Disney-May (Millfield), Daniel Fogg (ITC Loughborough), Kristopher Gilchrist (ITC Bath), James Goddard (ITC Stockport), Antony James (Plymouth Leander), Michael Jamieson (ITC Bath), Roberto Pavoni (ITC Loughborough), Robbie Renwick (City of Glasgow), Michael Rock (ITC Stockport), Joseph Roebuck (Loughborough University), Jak Scott (ITC Stirling), Liam Tancock ITC Loughborough), Grant Turner (ITC Loughborough), Chris Walker-Hebborn (ITC Bath), Joshua Walsh (ITC Stirling), Andrew Willis (ITC Bath).